On November 21st, this interesting looking cardinal showed up at a backyard birdfeeder in Eden Prairie, MN. Thanks to Nancy for letting me re-produce the photos. She wasn't sure what was up with this strange looking female Northern Cardinal chowing down at her Yankee Whipper. The head is white but it still has a red crest. This is a pretty classic example of partial leucism. I've posted a number of images of leucistic birds from around the metro before. There was the Leucistic American Goldfinch (also with white on the head though not as much as this cardinal. I really liked this leucistic American Robin as well. One of my favorites though was this odd leucistic purple finch that looked like some sort of odd ring-necked finch. Leucism results from defects in pigment cells in an animal's body. It can affect just one cell or all of the cells on an animal. This means we can get a bird with just one odd white feather or, as in this case, white feathers in just one part of the body. We can even get a leucistic bird with all white feathers but normal colored eyes, beak and legs. These are the individuals that are most often mistaken for albinos. A leucistic animal is sometimes called a partial albino but technically this is incorrect as albinism has a completely different cause and is systemic, never partial. True albinos lack melanin in all of the cells in their body thus the oddly colored eyes, beak and legs. I've never seen a leucistic bird before. What a find! My husband first saw this bird the other day at the feeder. I saw it today and wasn't quick enough in getting my camera to take a picture of her. What a pretty looking bird we live in the Northeast and this is the first time we've seen this bird. I've also seen one - in 2012 in the winter I thought maybe it was bald from a fungus or something, but she came back again this year - definitely white feathers. That's great David. They are very interesting. This is so interesting. I am a backyard birdwatcher and I just saw a female cardinal with the shocking white head at my feeder. First time! Im so thankful you posted this. I live around Tulsa, OK and have been seeing a white-headed, female cardinal for the last few months. She's beautiful! I knew she had to be rare! I'm glad to know what causes this anomaly. 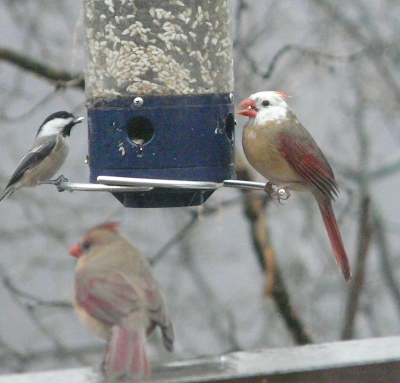 I am in St. Louis and also have a leucistic female at my feeder. It seems everyone has females. Do the males get this as well? Clearly, this is a case of somatic mutation. A skin cell at the head region experienced a mutation in one of the genes involved in the melanin biosynthesis pathway during development. The result is all of the cells that descended from that original mutant cell could not synthesize melanin, producing a "beauty spot" or albino feathered head. had the crest, but had white head. sent it by email to my other son. He found your site and sent it to me. I was so thrilled to finally give my cardinal a name. Had one of these Cardinals show up at my feeder this week in Smithville, MO. This is the first one I ever saw. Pretty cool. January 14, 2017 A leucistic female Cardinal showed up at our feeder on South Mountain, PA. I was fortunate to be able to get a couple of photos of it as it I have not seen it return. Thanks for your article as it cleared up my confusion on the bird's unique coloring. Wish I could post a photo for you. I live in Hickory NC and have been trying to figure what this bird is. So unusual and have never heard of it before. We are in the NC foothills. I have one on our back yard feeder in downtown Minneapolis. I've been wondering about her for about six months, so tonight I decided to google 'white headed cardinal" and your blog popped up right away. 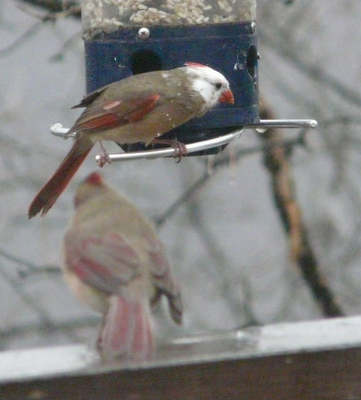 Very happy to now say knowledgeably to my birder husband that we have a leucistic female cardinal on our feeders.